Today I am sharing my latest ’22 Weeks of General Conference’. If you’ve never used my printable before, here’s how it works! First, you’ll need to print out my ’22 Weeks of General Conference’ printable (below). On the left side of the sheet are different topics that were discussed during General Conference. Pick a topic that you would like to read about, and then write it on the ‘November, Week 1’ space. All week long you will read and study those talks that are listed for that topic. Since there are more weeks than topics, you can split up a category with several talks into more than 1 week. After you have studied the talk(s), take time to discuss it with a friend, spouse, or VT sister. It’s always nice to hear what others got out of the talk(s). I get so much more from the Conference talks when I take the time to sit down and read and study them. I created this sheet to help do just that. AND I was able to include the General Women’s Meeting talks in this edition! Yay! If you would like to print out your very own 22 Weeks of General Conference, just click the link below! 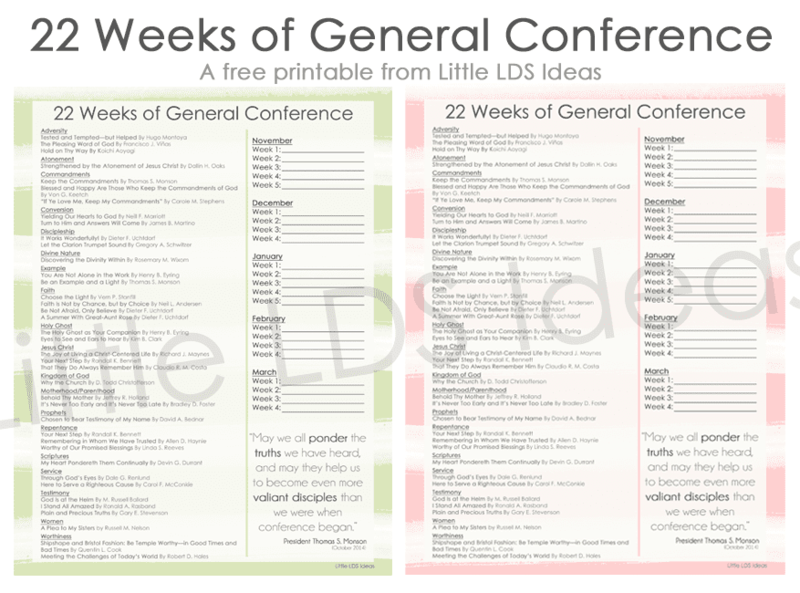 Click HERE to print my ’22 Weeks of General Conference’ sheet in Strawberry. Click HERE to print my ’22 Weeks of General Conference’ sheet in Lime. I also created a study sheet for individual talks. You can find that study sheet, HERE! 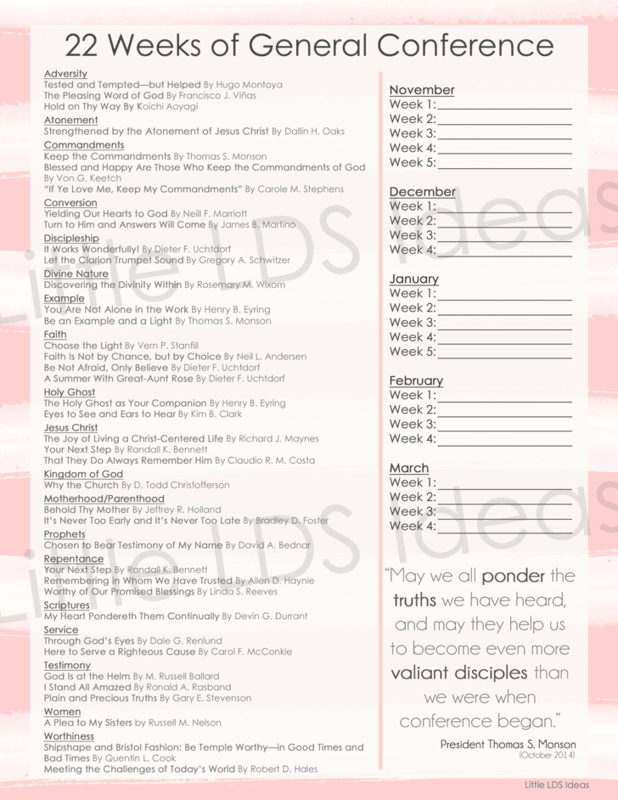 I hope you enjoy my ’22 Weeks of General Conference’ and are able to use the printable. I would love to hear if you do, and what your plans are or how your studies go. So come back and leave me a comment! Thank you for your talent and for your service in sharing this with us. I’m going to use this as an example of personal scripture study in my Relief Society lesson in a couple of weeks. Thanks again! Thank you for this. It will be a nice compliment to my scripture journal by topic! Thank you!! You are so amazing- I just have to say. I visit teach with an elderly lady and she just loves all the printables I bring along. I give you full credit. 😉 Is there anyway to adjust this with the months blank? We are a little late getting out this month and I wanted to do something like this for our visting teaching but sure I will look like a doofus since we are into the second week of November. Thanks again for all you do! This is such a great idea! Will you be doing it for the April 2016 General Conference, too?